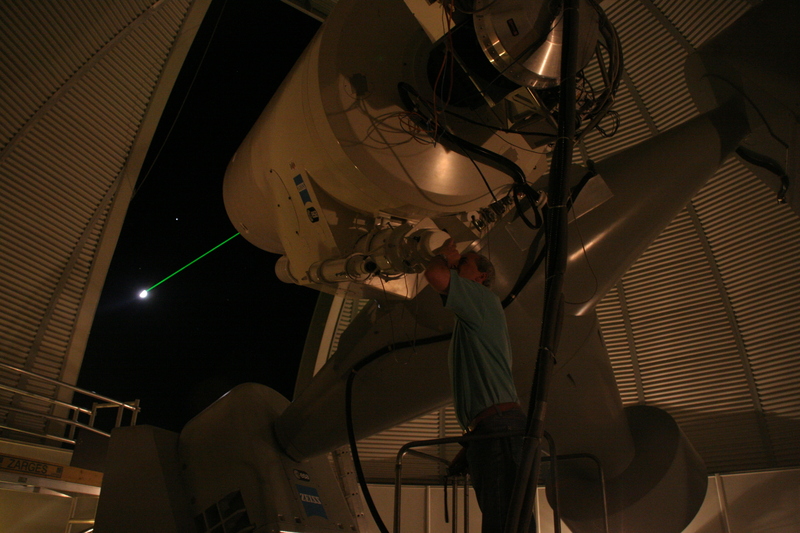 A green laser aims for the moon in an optical test (Credits: ESA). NASA and ESA are scheduled to test a laser communication link from a NASA moon-orbiting spacecraft to ESA and NASA optical ground stations sometime in 2013. “This will show that optical communication technology is ready for future science and exploration missions that need improved capacity to transmit valuable scientific data, while reducing onboard resources.” said ESA’s Lunar Optical Communication Link project manager, Zoran Sodnik. The activity will use an optical terminal aboard NASA’s Lunar Atmosphere and Dust Environment Explorer (LADEE) spacecraft to communicate with three ground stations: ESA’s Optical Ground Station in Tenerife, Spain, and two NASA optical ground terminals in California and White Sands, New Mexico. ESA pioneered the use of spacecraft-to-spacecraft communication links in 2001, when it operated an optical link between terminals on ESA’s Artemis and CNES’ Spot 4 Earth observation satellite, and is planning on using them for future satellites Alphasat and EDRS. Laser-based optical links can provide very high data rates, up to 100 times higher than those achieved by current radio-based ground stations. This not only enables spacecraft to transmit more data, such as high definition video streaming, but also to reduce operating costs, as more data can be transmitted in less time and using less ground stations. Optical terminals are usually also smaller and require less power when compared with radio systems providing similar data rates. On the downside, optical links are subject to atmospheric turbulence and weather conditions, and may experience lower availability if no alternate ground stations are available. Lasers, whose potential space applications include space debris tracking and removal, and spacecraft navigation, also present a potential hazard to aircraft operating close to the ground stations due to adverse effects they may have on the pilots or passengers. United States’ Federal Aviation Administration (FAA) currently requires any entity operating lasers in navigable airspace to file a notice no fewer than 30 days before the operations take place. The Lunar Atmosphere and Dust Environment Explorer mission, part of NASA’s Lunar quest program, is scheduled for launch in 2013 on a Minotaur V rocket, and has a planned duration of approximately 5 months. NASA’s Laser Communications Relay Demonstration (LCRD) is a longer duration project demonstrating space-to-ground laser communication links that will follow in 2016.